ho said desktop computers are outdated? Yes, the market is flooded with ultra mobile laptops, multifunctional tablets and all kinds of innovative hybrid decisions. When it comes to hard work, however, you will agree that the last step aside. In this video review I will prove my point. Digital Magnet presents HP Pro All-in-One 3520 PC. The technology revolution moves towards the more compact and flexible computer solutions but in the world of desktops this doesn’t happen at the expense of power. Desktops are still the best solution for professional software. This is because they offer power, reliability and flexibility in one place. But who said they haven’t become more compact and multifunctional? 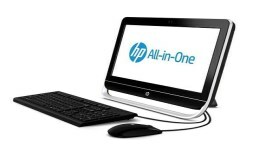 HP Pro All-in-One 3520 PC combines an innovative elegant design where hardware and screen meet in a multifunctional case. The 20’’ TN widescreen is WLED backlit LCD with native resolution of 1600×900 pixels. The graphics on this widescreen are provided by the integrated Intel HD Graphics 2500. The screen is bright and matted so that your work process is not disturbed by annoying reflections, coming from the window of other lights. The colors are vivid and the details – clear thanks to the sharpness and excellent contrast ratio. The graphics on this widescreen are provided by the integrated Intel HD Graphics 2500. This desktop PC definitely impressed with its innovative and flexible design but let’s see what HP offers behind this nice appearance. The processor on board is a dual-core Intel Core i3 @ 3.3 GHz and has 3MB cache. The excellent performance this machine provides is also brought to you by the 8GB DDR3 RAM @ 1600MHz. The hard drive storage on board is plenty, you are equipped with 1TB of space. But in case you need more, you can easily make it double. The hardware fill of this machine make it a perfect desktop companion both for business use and at home as well. The video-call communication is excellent thanks to the 1MP integrated HD webcam that performs great even in low-light conditions. It is combined with a 2 microphone array too. This desktop PC excels with excellent connectivity abilities. Sooo let’s start, I hope I don’t forget something … there is 6-in-1 media card reader, a headphone and a microphone in, 2 USB v3.0 ports, and 4 more USB ports v2.0. There is also an audio out and a DC in. The expansion slot is a mini PCIe. The internet connection is established through LAN or Wi-Fi. Except the computer itself, in the package you will also find an included keyboard and a mouse. And there you go, now you are ready to enjoy the power of this multifunctional screen. You can load this machine with the latest Microsoft platform – Windows 8.